We form ideas based on our first impressions – it’s a fact of life. It’s not really fair and can lead to some bad conclusions. (Ask me about General James Longstreet!) So even though there’s the old saying “don’t judge a book by its cover”, in the literal, visual world of publishing that’s exactly what happens. Aware of this fact, I knew I needed to convey a very specific image and feel on the cover of my first historical novel. I wanted it to be eye-catching in a beautiful, traditional way, and was blessed to meet and work with an award-winning artist. Cheryl Schoenberger has had a life-long interest in art and has been formally studying oil painting under the tutelage of Wei Lo in Montrose, CA, for seven years. 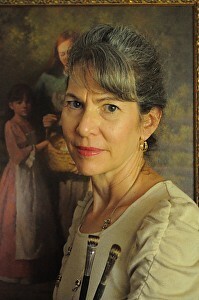 Cheryl’s artwork has recently won several awards. Art is testimony and witnessing tool for Cheryl, and she is devoted to sharing her Christian faith through her work and as she interacts with other artists and patrons. She says: “I believe that God is the Creator of all things, and this has directed my approach to light and shadow. When God spoke light into existence with the words, “Let there be light,” a whole new realm of beauty was created. He “saw that the light was good; and separated the light from the darkness,” and ever since artists have been intrigued with that light and resulting shadow on a form. “Every artist borrows from God’s creation and incorporates what he sees into a creation of his own. This is an affirmation that God’s creation is supreme. That light that He made, and the resulting shadow it caused, enhance the beauty of the form, drawing the focus away from one area to another. Yet for a painting to be pleasing, there must be both, creating an anti-thesis. This is a reflection of the world in which we live: ie., if there is truth, then there is also a lie, if light… then dark, if day… then night, if black… then white, if good… then evil, if right… then wrong. During a busy Civil War re-enactment, my friend Cheryl was interested in the research I was doing for a historical novel and casually mentioned that she was an artist and might be interested in doing artwork for the cover. I expressed non-committal thanks and didn’t think seriously about it for eight months. Then, I was curious and searched “Cheryl Schoenberger, artwork” on the internet, quickly found the art website, took one look and knew I’d found the right artist…if she was still willing. Where could I find a young lady in her early teens with dark hair who would look charming in 1860’s clothing and actually be willing to pose for photographs which would be used as the basis of the painting? I wasn’t sure. I couldn’t do it, and, despite what some of my fans might supposed, I didn’t want to be the model. I wasn’t Betsy Westmore! A young lady who attended Bible study at my home was fourteen, had dark brown hair, a lovely smile, and seemed to be about the right height. I talked with her and her parents, and they were excited about the idea. We took some “test photos” while she wore an old-fashion style dress and hairstyle, and Cheryl approved. Our “Betsy Westmore” for the artwork had been found! November 1, 2014 After several lengthy discussions about weather, sunrise vs. sunset, clouds, Gettysburg countryside, 1860’s clothes, artwork composition, model poses, and a host of other details, it was time for a photo shoot. As our “Betsy Westmore” was preparing and we were working on her hairstyle, it was raining heavily. But the storm passed and by the time “the crew” got to the photography location at a local park, the sun was breaking through the clouds and creating some lovely natural lighting. About 1,000 pictures later, we returned to the studio room and enjoyed visiting while the pictures downloaded. Then came the challenging moment. Cheryl, our “Betsy Westmore”, and I started narrowing the selection of possible photos. When we had three choices, we called for second opinions from my mom and Cheryl’s husband, Mark. Interesting, we all agreed unanimously on the same photo! December 2014 I was excited to received pictures of two “mock-up” paintings which gave me the chance to chosen the final angle and see the color palette. 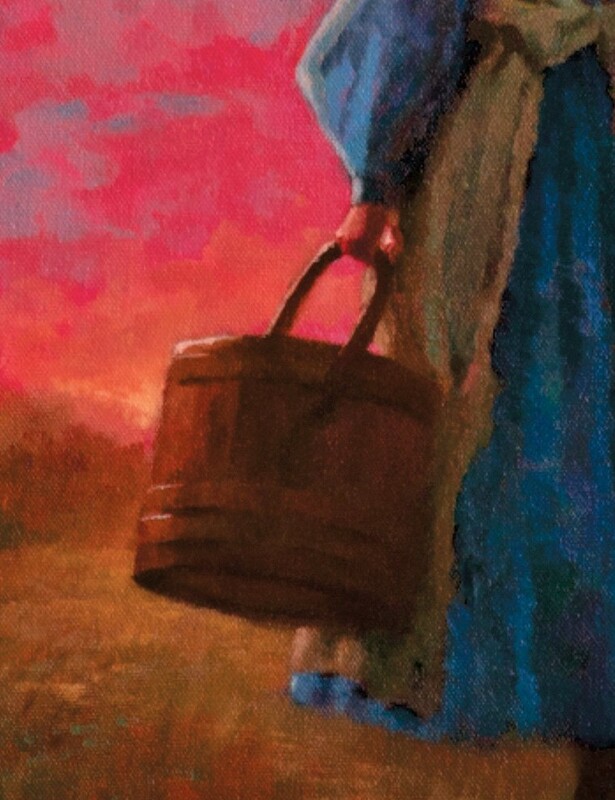 Though both samples were nice, I decided I still wanted the image of a young lady in profile, carrying a water bucket and walking toward a blue, gray, and crimson sunrise. January 2015 During the next weeks I waited anxiously to hear about the painting (and avoided calling or emailing Cheryl every day to inquire.) Toward the end of January, we visited the Schoenberger’s home, and I got a sneak-peak of the artwork on the easel. February 2015 I received a message: The artwork is ready. Very excited, I made arrangements to sign the paperwork and check and bring home the painting. Mark Schoenberger gave the painting its official name: Up At First Light. When I first saw the finished painting, I thought “WOW! It’s the scene from the story come to life.” It was a very special moment. 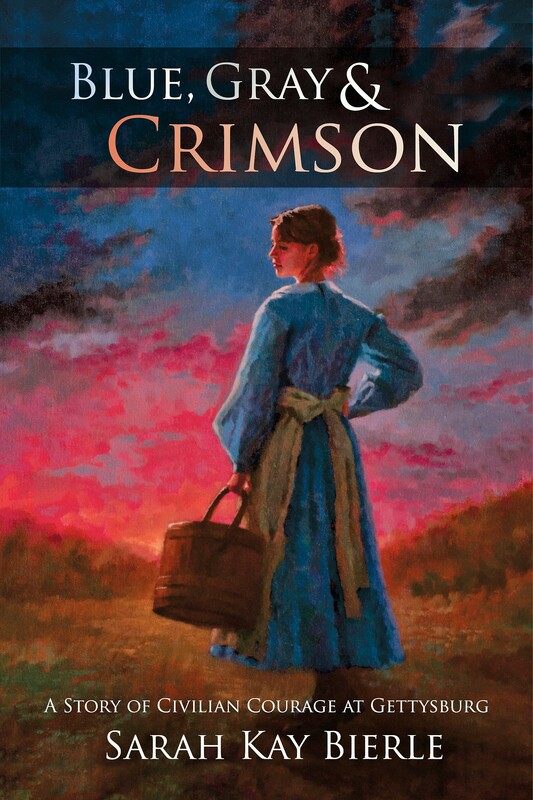 June 2015 The first proof copy of Blue, Gray & Crimson: A Story of Civilian Courage at Gettysburg arrived and the cover was exactly what I had envisioned. It was quite a day when I got to sign a copy, write a thankful letter, and send Cheryl a copy of the book. 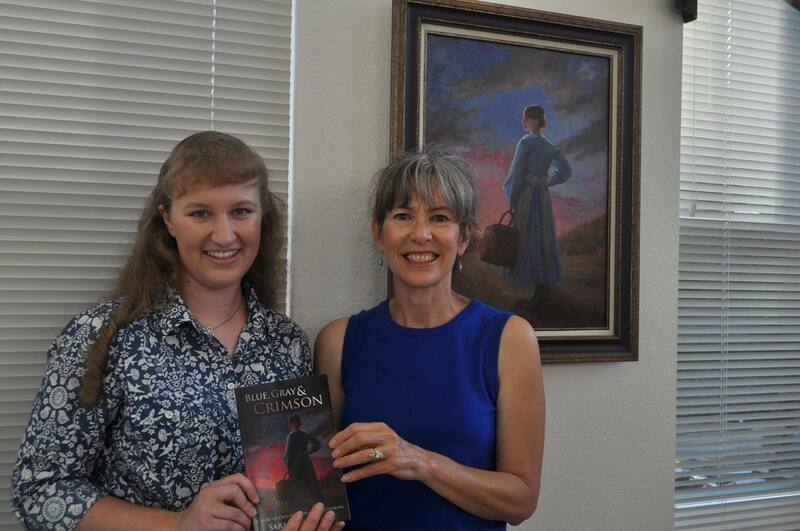 A month later, Cheryl was able to attend the book release party and we got to take pictures holding the book while standing near the original artwork. Sometimes I can’t believe how perfectly the artwork matches my first idea…and improved it. I absolutely love the coverart of my historical novel! When I look at a copy of the book or at the original artwork, I’m reminded of joy of working on that part of the project and getting to spend time with an encouraging Christian lady. It was a wonderful blessing to work with Cheryl to and to share prayer requests for the project. The vision of the book was truly captured and brought to life on canvas for the original artwork.